The sound is lucidly clear,even after all these years: the rumble of apples rolling down the industrial wooden cutting board. Standing in the middle of the quiet church kitchen, I was still. Catching a glimpse of the shiny long knife peaking from the drawer ajar below the counter, I knew I was in trouble. It was a usual Friday afternoon: hanging out with friends in the youth lounge, getting music ready for the weekly Bible study. A deacon in the church called me to the hallway and handed me a black plastic bag stretching at the sides with round lumps of large apples. Guests were visiting the senior pastor: please, quickly, peel and cut these for the guests. As he handed me the heavy bag, the weight of the request fell heavier on my 16-year-old back. I broke the thickness of the air with a smile of great confidence and made a hasty move toward the counter of the church kitchen, looking as if I knew exactly what I was doing. I grew up in a family of a brother and two other sisters. My Korean parents were atypical in that gender-appropriate roles were not established at home. Basically, I had never peeled fruits . . . nor done many other tasks in the kitchen. Staring at the large apples now scattered across the wooden board, I was angry at my mother who never taught me how to peel apples. Once an ancient measure for determining a maiden’s virtue, the delicate art of spiraling the apple peel with a sharp knife was foreign to a girl who preferred just to bite into a whole apple. But in this moment I was stuck. I could not disclose what I experienced as a shameful confession: I don’t know how to do this. Was it my pride? Or was it something else, some other force I couldn’t recognize then? There was a swell of genuine fear that admitting my lack of expertise around the church kitchen would diminish my image as a “good”—“godly” even—Christian girl. So, with adolescent resolve, I decide that I will produce apples on a plate for the pastor and his guests. I began to carve pieces of apples, each looking like the crescent-moon slices I had been served in my relatives’ homes. Thanks to the initial size of the apples and to some techniques picked up from a sculpting class I took in junior high school, I produced a reasonable number of small apple pieces to deliver to the pastor’s office. I am always surprised by the residual sting of this memory. I think it is because the story isn’t simply about my shyness to speak up. It isn’t even about those daunting apples. It is about a message I perceived in my experience of the church’s life that compounded over time. A message that told me that I should be at ease with such domestic requests and that it would be assumed that I was available for such tasks. Somewhere tangled up in that message was an absurd notion that my industrious ease with domestic skills formulated into my Christian identity and faith practice. After all, in the church where the formative years of my faith took place, men were the pastors, men were the preachers, men were the elders, men led congregational prayers. Men in dark suits served communion. Women taught Sunday School, they made delicious Sunday lunch for the church, they washed those gigantic pots, they organized the women’s ministry. It’s true that sharing food is important in a faith community, and ministry to children and young people is crucial for sustaining the Church. And life-giving friendships are formed among the koinonia of women. At the same time, I believe preaching, teaching, justice-seeking, guiding, decision-making, worship-leading, pastoring, praying, counseling, and ministries of reconciliation are callings and responsibilities faithfully enacted by all of God’s beloved, for whom God has uniquely provided gifts. The Korean American church remains, for the most part, uncritically genderized in its ecclesial life. The lack of women in pastoral leadership demonstrates the gender inequity that pervades our theology, polity, and cultural consciousness. When a young woman raised in the Korean immigrant church (or in the church’s second-generation and multiethnic offspring) discerns a direction to enter seminary and later responds to a call to ordained pastoral ministry, instead of rejoicing, church members and pastors alike question if her path is God-honoring and biblically correct. The lack of support and advocacy is expressed, by default, in the church’s passivity or silence. I have yet to witness a critical mass of voices to at least signal that gender inequity and sexism are even noticed by the Korean American Evangelical community. Too often, women who speak—with passion and intelligence—from the intersection of a racialized and genderized identity are avoided like unwelcome guests, disurptions to the well-ordered harmony of complementary roles that maintain things as they are. Many Korean American women in ministry have had to step outside of our home contexts to fully grow and live into our vocational callings—into other imperfect, yet less restrictive contexts. The preceding generation of female clergy has had to employ creative strategies for partaking in the life of the church, by way of chaplaincy, academia, and constituent-specific ministry, for example. To be sure, there are pioneering Korean American women clergy and growing numbers of young women discerning calls to pastoral ministry, particularly in mainline denominations. They serve primarily non-Korean (mostly non-Asian) congregations. A countable few are heads of staff or in senior pastoral positions. Some gather to galvanize energy and find embrace among colleagues within denominational associations. But self-advocacy gets tiring. And sustaining the conversation only with those who perceive it as urgent exacerbates the fatigue over time. This is when a surge of collective advocacy can replenish one’s sense of belonging and validity within a larger community—in this case, the Korean American ecclesial community. Unfortunately, that community, led by those who hold tremendous gender privilege, has all too often used dismissal or disengagement as its modus operandi. I do not want to discount male colleagues who engage in the discourse or the few who stand in solidarity with female clergy or actively cultivate emerging leadership among women in the church. I do not want to impose my views on Korean/Asian American women in ministry who may express entirely different experiences or desires than what I am describing here. But Korean/Asian American theologians and ministers rarely challenge the church’s insistence that the appropriate posture of a woman is submission ― or assuming the glorified “helper” role ― while men are designated for protective, supervisory, or “pastoral” roles. The Korean American church at large would benefit from a serious reflection on the ambiguous intertwining of patriarchal systems, cultural aesthetics, and commitment to a claimed orthodoxy of polity and hermeneutics that preserves the status quo of male leadership as normative. The church has changed and is changing as she speaks truth and grace into a changing world. Yet, we remain bound by the convenience of our cultural embeddedness, for which some have found supporting theological and biblical interpretations. While I recognize that I, too, am a product of culturally-constructed theological and heremeneutical understandings, I have also come to learn that I am and can become more than just the shape of my experience. Many years after that afternoon in the church kitchen, I returned to the Korean immigrant church, determined to learn the story of my faith heritage. I served on a staff of 30 pastors, of whom only 3 were women. I spent early dawn hours in daily prayer service; I sat in very long staff meetings where the senior pastor spoke for most of its duration. During these first years in ministry, I learned both my mother tongue as well as the faith language and spiritual richness of Christ’s body as it converged with the deep roots of Korean culture. I am grateful for these gifts and continue to be sustained by them. However, there were limits set to the shape of my ministry. I could not envision fully becoming and growing within the confines of an overtly genderized church culture. At staff gatherings, my seat was assigned with pastors’ wives and the other two female pastors. The old role assignments, divided along the line of gender that I observed in my youth, were assuredly intact. I have served in variations of these arrangements in first-generation and second-generation congregations in different regions of the United States where my life and learning pursuits have taken me. Yet I was always only a partial version of myself in these churches. The church that is most home to me today is not the Korean American church. It is a church where gender is not used as a test of my qualification for partaking in various forms of Christian ministry. A church where women and men preach prophetically, lead with vision and intelligence, and pastor with compassion. A church where women’s ministry is marked by a grappling with messy dialogues about faithfully impacting systems of social inequities with Christ’s message of justice, inclusion, and redemptive hope—and not by an insidious perpetuation of a narrow and genderized image of Christian discipleship . . . one adorned neatly with Pinterest-worthy projects. We all navigate multiple contexts and try to make sense of the complex layers that constitute our identities. We traverse back and forth between belonging and exclusion in a world that separates more than it binds. Many of us live in the borderlands of defined communities; we never quite fully belong. I become keenly aware of this liminal existence as a woman-bodied minister in the Korean American church and equally as a woman-Korean-bodied professor in the seminary or university classroom. That is to say, as much as I lament the insulated walls of the church, my distance from the Korean American church is not far. It is tentative, I hope. I look forward to the day when I can return, knowing that my three whole-apple-chomping children will experience a community that regards with reverence and joy the diverse responses to grace by diverse people. It will be where their spiritual heritage of utter dependence on prayer and of jung-saturated believers’ fellowship propels each of them to a Christ-following confession of life lived generously, hospitably, and in advocacy for those who are left out. I hope for the in-breaking moments of resting in God’s vastness with brothers and sisters, sharing in humility and gratitude for God’s invitation for us—together—to partake in the day’s work already begun even before we put our human touches to it. The vocation to which I am called is renewed by this real hope of a here and now where all of us, each of us—equally created in God’s image—can live and move and have our being in the extravagant freedom and love extended to us in Christ. 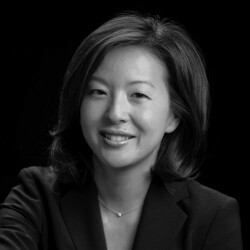 Charlene Jin Lee has her PhD from Union Theological Seminary and her EdM from Harvard University. She teaches practical theology and spiritual formation at Loyola Marymount University.